Product information "HI981032 Foodcare Cheese pH Tester"
Specialized electrode for spot checking of pH during the cheese making process. The compact size makes the Cheese pH Tester ideal for on-the-go testing. A large LCD display provides at-a-glance readings from any angle and single button operation streamlines the testing process for any user. Your measurements require detailed attention; so should your electrode. 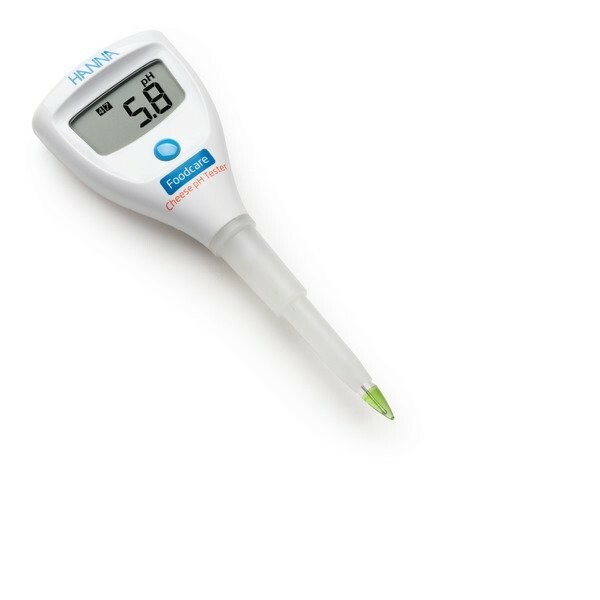 The HI981032 Cheese pH Tester features a built-in probe that has been carefully designed to measure the pH in almost all types of cheeses and curds. The conical shaped tip design allows for penetration into solids, semi solids, and emulsions for the direct measurement of pH in a variety of milk based products used during the cheese making process. Low Temperature (LT) glass is used for quicker results at lower temperatures. Polyvinylidene fluoride (PVDF) is a food grade plastic that is resistant to most chemicals and solvents used for disinfection in the food sector, including chlorine (bleach). We believe that buying a tester should be simple. Your Cheese pH Tester is equipped with everything you need for successful testing right out of the box. Your Cheese pH Tester comes with cleaning solution that has been engineered to keep your electrode free from cheese build up. This concentrated combination of detergents cleans your tester quickly and effectively so that your tester stays in optimum condition. Related links to "HI981032 Foodcare Cheese pH Tester"
Customer evaluation for "HI981032 Foodcare Cheese pH Tester"